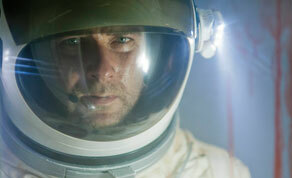 Liev Schreiber in 'Last Days on Mars'. Irish director Ruairi Robinson’s ‘Last Days on Mars’ - which screened as part of the prestigious Directors’ Fortnight at the Cannes Film Festival - has been picked up by US distribution company Magnet for a VOD release later this year. The Wagner/Cuban Company’s Magnet Releasing is the genre arm of Magnolia Pictures, with the deal negotiated by Magnolia Senior Vice President of acquisitions Dori Begley and Focus Features director of acquisitions Peter Van Steemburg. The film stars Liev Schreiber (‘Scream’, ‘X-Men Origins: Wolverine’); Elias Koteas (‘Shutter Island’, ‘Crash’); Romola Garai (‘One Day’, ‘Atonement’); Olivia Williams (‘An Education’, ‘The Sixth Sense’); and Tom Cullen (‘Downtown Abbey’). The plot follows the astronaut crew of a Mars base who discover fossilized evidence of bacterial life, which leads to disaster when one of the crew members falls into a sinkhole and becomes infected with the alien life-forms. ‘Last Days on Mars’ is a Fantastic Films and Qwerty Films co-production with Irish Film Board funding, produced by Fantastic Films' Brendan McCarthy and John McDonnell, along with Michael Kuhn and Andrea Cornwell. Ruairi Robinson was nominated for an Oscar in 2002 for his Irish Film Board-funded short ‘Fifty Percent Grey’. Director of photography Robbie Ryan and screenwriter Clive Dawson also worked on the film, with post-production handled by Irish VFX house Screen Scene.